A new face has made his way to Canifis, and he is looking to assist the Myreque, a group of heroes in the area, by providing them with weapons for their battle. Can you help him with his task? A new stranger has appeared in Canifis with a job to track down some local heroes known only as "The Myreque". 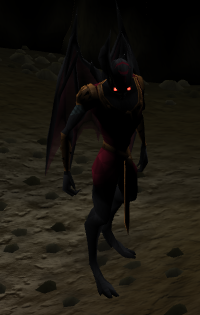 The Myreque are fighting a desperate battle against the darkness of Morytania and he wishes to take them weapons to aid in the battle. Can you help him out? Talk to Vanstrom Klause in the Hair of the Dog Tavern in Canifis. To begin the quest, head to the town of Canifis, which is in Morytania. 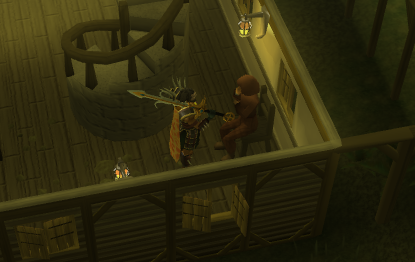 Go into the Hair of the Dog Tavern and speak to Vanstrom Klause, who is standing in the corner near the staircase. After he tells you that his friends need help, ask him what he needs help with. Vanstrom will tell you that they are short of weapons and that he needs you to deliver. Tell him you'll help him out, and ask him where the weapons need to be delivered. He'll mention a boatman down in Mort'ton that could help you out if you persuade him. Say yes to his offer and you've started the quest! Cyreg will then back down. Before he lets you use his boat, he'll ask for a druid pouch with at least 5 charges in it, otherwise he won't let you use his boat. You'll also need six planks, your steel nails, and a hammer. Cyreg will ask for 3 planks before getting on the boat, give it to him and you're on your way! Once you land in The Hollows, walk northwards until you find a rope bridge. Climb the tree to get on it. Once you are on the bridge, repair it by right clicking on certain parts as you walk along and your character will use the materials to fix it. Once you are off the bridge walk a few steps north towards Curpile Fyod. Talk to him, tell him that you have come to help the Myreque with a delivery of weapons. He'll make sure you're not planning against the Myreque with a short three question quiz. Here are the answers to all the questions you can get. Who is the youngest member of the Myreque? What member of the Myreque was originally a scholar? What family is rumoured to rule Morytania? What is the boatman's name? 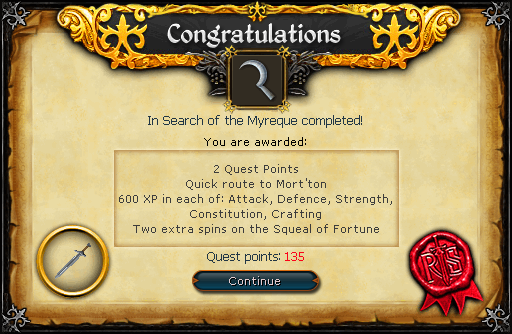 Who is the leader of the Myreque? Name the only female member in the Myreque. Once you pass the quiz, walk past Curpile to the other side of the mound and open the wooden doors. Walk through the cave into an outcrop on the eastern wall. Squeeze past the stalagmite and you'll find the members of the Myreque. Talk to Veliaf Hurtz (you don't need to explore all the conversation options). Introduce to yourself to all the other members of the Myreque. You don't need to go through every conversation path, just saying “Ok, thanks” and then talking to the next person works. Once you've introduced yourself to everyone, be prepared for a fight, and talk to Veliaf once more. A cutscene will start. Some mist will enter the room and Veliaf will realize that a Vampyre has entered. The Vampyre reveals himself to be Vanstrom, who says that your character led him straight to the Myreque. Vanstrom kills Sani and Harold, and then sprouts his wings and flies away. Vanstrom leaves his Skeleton Hellhound to attack you. It's level 64, so using the Protect From Melee Prayer helps greatly. If you are using Ranged or Magic, you can run behind a rock and use it as a safespot. The Hellhound is an easy fight, and should die quickly. Once he dies, he will drop four Big Bones and two Uncut Rubies. Once you've killed the Hellhound, talk to Veliaf and ask him how to get out. He'll tell you about a moveable wall that can lead you back to Canifis. Go back into the main tunnel and travel to the north end. Search the wall to walk through it and then go up one of the ladders and you'll find yourself in Canifis. Now go back into the Hair of the Dog Tavern. Talk to the Stranger who is standing in the exact same place that Vanstrom was at the beginning of the quest. Once you have finished your conversation the quest will end. [^] Talk to Vanstrom Klause to start the quest. 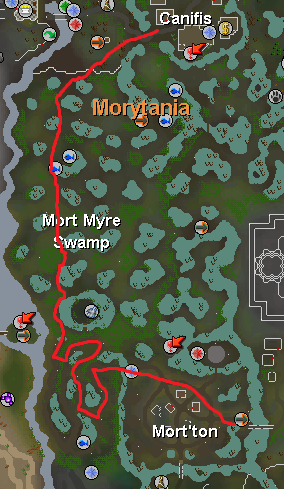 [^] Go through Mort Myre Swamp and get to Mort'ton. [^] Talk to Cyreg Paddlehorn. [^] Take the boat to the Hollows. [^] Repair the damaged bridge. [^] Talk to Curpile and pass his quiz. [^] Enter the tunnel, and squeeze past the stalagmite to find the Myreque. [^] Talk to all the Myreque members. [^] Defeat Vanstrom's Skeleton Hellhound. [^] Go through the underground passage to Canifis. [^] Talk to the Stranger in the Hair of the Dog Tavern.